One of the most sought-after beers in the world is Westvleteren 12, the quadrupel ale brewed by the Trappist monks of Saint Sixtus Abbey in Westvleteren, Belgium. Adding to the mystique is the fact that the brothers do not distribute their beers through wholesalers or exporters. The abbey has a cumbersome system where individuals can call the brewery during certain hours to reserve a maximum of two cases of beer for pickup on a different date. Phone numbers and license plates are tracked to restrict each buyer to one such purchase per month. This limited distribution not only makes beer from Saint Sixtus taste better, it practically guarantees that a tourist won't be able to stuff his suitcase with a case of Westy. A few bottles of Westvleteren -- the aforementioned 12, a dubbel called Westvleteren 8, and a hoppy golden ale called Westvleteren Blond -- make their way via the black market into bottleshops and bars in Belgium and Holland at a premium price. I shelled out about 20 bucks for a 33 cl bottle of the quad at Gollem's Proeflokaal in Amsterdam. 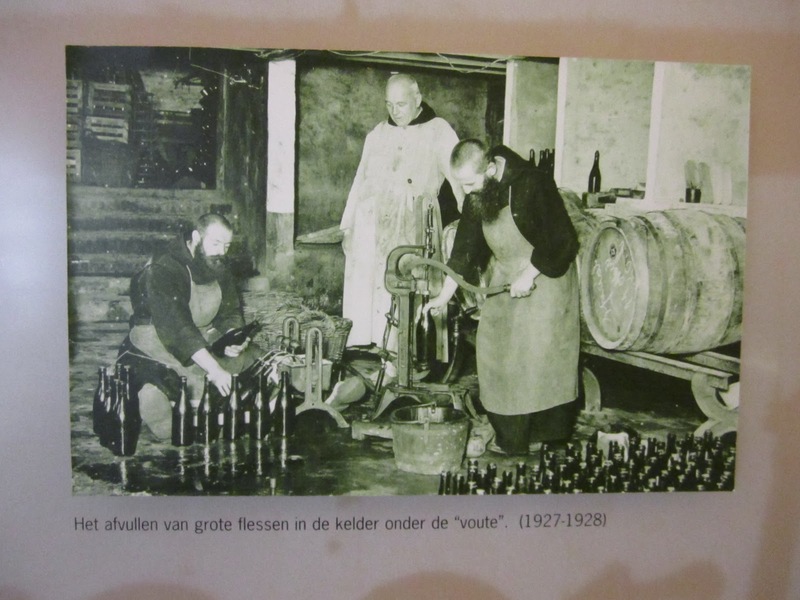 The other way you can sample these beers is to visit the Abbey, where the cafeteria -- In De Vrede -- will serve you the quad, dubbel, or blond for the reasonable tariffs of €4.7, €4.2, and €3.7 respectively (about $6.60, $5.90, and $5.20). It's bottled beer, not draft, but poured into the official goblet. An attached gift shop apparently used to sell six-packs -- limit one per customer -- but on the day we visited there were only "tasting kits" for sale: €23 for two bottles of the Blond, one 8, one 12, and a goblet. Sheesh. We visited In De Vrede ("Vrede" means "peace" in Dutch) on the way from Brugge to Brussels. It was a little bit of a detour, but well worth it for the chance to try all the Westvleterens at a reasonable price. It's an odd place, nothing like a bar or pub I called it a cafeteria above, and that's truly what it is. 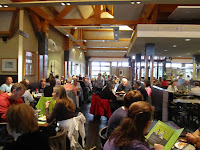 At 1:30 on a weekday afternoon, the place was packed, and it seemed to me to be largely a local crowd, demographically on the older side. The food is very simple and inexpensive, basically cheese sandwich, ham and cheese sandwich, or house-made paté sandwich, to which you could add a side green salad. I loved the paté; the salad was fresh and good. The girls got ice cream sundaes that were kind of lame, but the ice-cream made with Westvleteren Blond served to neighboring tables looked much more interesting. The servers all seemed to speak English well, and were very polite and helpful. Westvleteren 12 is a dense, complex quad, with the usual Abbey ale yeast flavors, a nice balance of bitterness, not too sweet, and with no sharp edges to any of the flavors. The 8 is recognizable as 12's little brother -- much of the same flavor in a less boozy package. The Blond is a nice surprise -- a fairly light-bodied ale, 6% alcohol, with lots and lots of hop bitterness. It reminded me of some of Hair of the Dog's Little Dog small beers -- which also combine light brews with tons of hops -- though of course it's about twice as strong as the Little Dogs. There is a small museum behind the cafeteria called "The Claustrum". As with the beer sales, its hours are idiosyncratic, and all of the information is printed in Flemish, but it's worth a quick gander if you're there when it's open. The picture at the top is from the brewery exhibit at the Claustrum. Since we were driving through Belgium twice during our trip, I did actually try to call from Paris and order a case of the Westvleteren, even though the abbey's website showed that they were only only accepting orders at that time for the not-as-collectible Blond. But I gave it up when the abbey's beer line rejected my phone call placed through Skype. We didn't have a phone in our Paris flat and our rental car was already completely full with no room for a crate of beer, so I decided not to flagellate myself any further with Saint Sixtus' convoluted procedures. The owner of the hotel we stayed at in Brugge confided to me that later this year the monks will begin limited distribution in Belgian grocery stores, but BeerNews.org reported the same rumor last year, so readers in Belgium should not break their piggybanks just yet. I don't know if Westvleteren 12 is really the best beer in the world. But it certainly is a fine abbey ale, and if you have the chance, you should try it. In Amsterdam we tasted it alongside the fairly similar St. Bernardus Abt, and the Westvleteren was indeed the more complex and refined beer. Get it if you can, and certainly pay a visit to In De Vrede next time you're in Flanders. Further reading: Check out this excellent tale of walking around the Westvleteren area on Jeff's blog The Beer Cave! I stayed in Poperinge for a couple of nights specifically to check out In De Vrede. While having some westvleteren beers at the source was the cause for the trip, I found the whole area fantastic. It was also great that it could all be done on foot from town. We hit in de vrede, st. bernardus, noel cuvilier, wally's farm, de helleketel, and a few smaller beers bars here and there. I really wish I had included Struise in that trip too, since it's right there. Oh well, next time! That is an excellent post! I added a link to it. You guys just walked along the country roads? Or were there some footpaths we didn't see? That's on the walk to in de vrede from poperinge. I think if I went to that area of west flanders JUST for In De Vrede, I'd be a little disappointed, but with everything else we were able to see and do while we were there, I couldn't recommend the trip to Poperinge or Watou enough. Random tidbit: when Block 15's Nick Arzner went to Belgium, he was blown away by Westvlerteren's beer too--the blond. (The quad he found nice but something less than the ambrosia its billed as.) He brewed an homage to the blond called Wandelpad which he brought last week to the Ville Provision release. A tasty, sessionable beer with a nice snap of hops. All the beers there are great. I think the blonde was the big shocker because you don't really hear too much about it compared to the 12, or even the 8. If I lived nearby, I'd drink a lot more 8 and blonde than 12. I think they're both just as well crafted, but much more drinkable. I think when I went, I was so caught up in the experience of just being there and having "the best beer in the world", that it would have been fantastic regardless of what they had served me. Still, I thought the 12 was awesome on it's own merits. I have a bottle or two at my house right now, it would be interesting to try it next to a rochefort, st. bernardus, etc... and judge it that way. westy 12 isn't too hard to find here in Portland if you know where to ask for it.